• On January 30th, 2017 Bushiroad will be introducing new product news, new details about the anime and new characters, and various events. In January, the “Get! Treasure Campaign” system will be introducing a “Dimensional Robo” Sleeve & Deck Holder set for 3 Points. Cont (RC) GB2: This card isn’t Retired even if Hit. Act (RC): [Counter Blast 1] During that turn, this Unit cannot be Retired by the effects of cards. 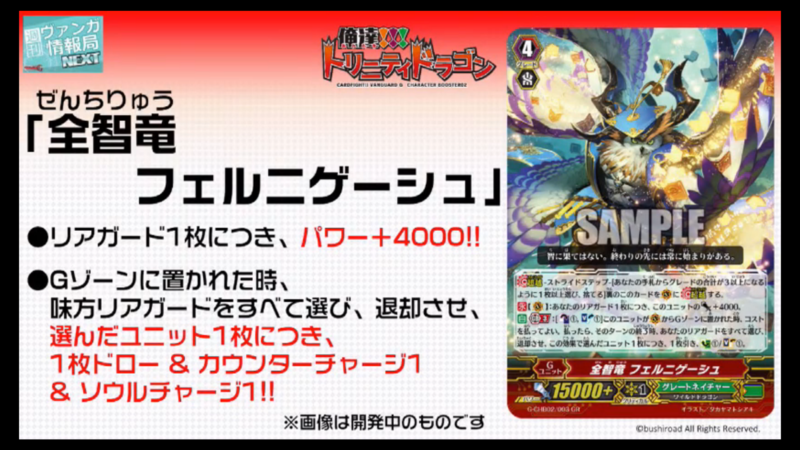 Cont (VC): For each of your Rear-guards, this Unit gains Power+4000. Auto GB3: [Counter Blast 1 & Soul Blast 1] When this Unit is placed on (VC) from the G Zone, you can pay the cost. If you pay it, when that turn ends, choose all of your Rear-guards, Retire them, and for each Unit chosen, Draw 1 card, Counter Charge 1/Soul Charge 1.